Wondering what salt therapy is? What are the most important items that I need to know? Please arrive 15 minutes early. Refrain from wearing any strong-smelling scents, including lotions, colognes and perfumes. We ask that you or your child not come in if actively sick or potentially contagious. Salt therapy is used as a prevention from getting sick, a way to boost our immune systems while healthy and to manage the symptoms from sinus and respiratory conditions. We recommend wearing comfortable clothing: preferrably light colors as the salt can show more on darker color clothing. Socks must be worn at all times while in the salt room. We ask that everyone bring a pair of socks if you and your child are not wearing any. We provide toys, books and the option for your little one to watch Netflix. You are welcome to bring your phone into the session as long as it is not disruptive to other people in the room with you. You and your little one can expect to feel a tickle in your throat or a runny nose. This is the salt doing its job. As the salt works its way into your sinus and respiratory systems it is working as an anti-inflammatory agent, allowing the airways to open and mucus to expel. Your cough and runny nose may linger after your session or begin hours later as your airways continue to expand, allowing your body to get rid of bacteria, allergens, and mucus. What do I do during the salt session? Once you arrive and fill out some paperwork you will be asked to listen to our short introduction which explains everything you need to know. 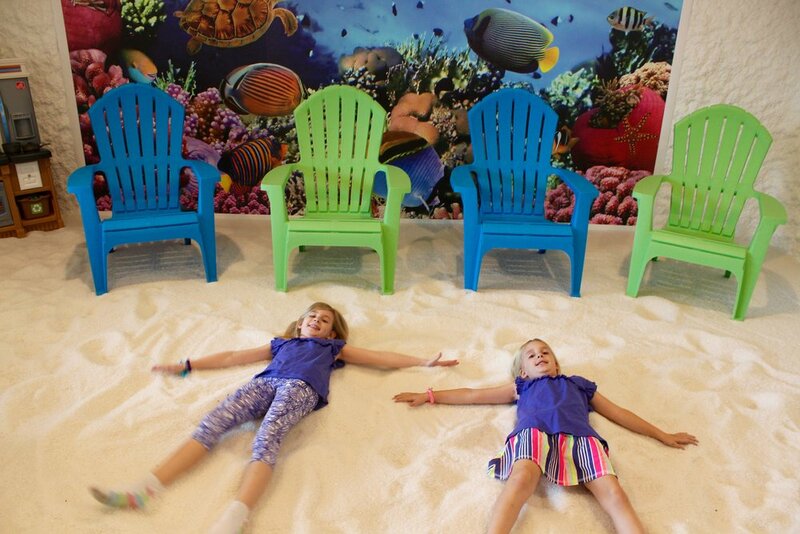 You are now welcome to play, dig, watch TV or simply relax while you and your child receive the benefits of salt therapy.